If you just arrived in the United States and wanted to understand the difference between the Republican and Democratic vision for America, a good place to start would have been Donald Trump’s State of the Union address followed by Stacey Abrams’ Democratic rejoinder. At the conclusion of his SOTU address, Trump asked: “What will we do with this moment? How will we be remembered?” And responded, “I am asking you to choose greatness.” This was consistent with the military frame of his address. And Trump’s self-image as commander-in-chief. 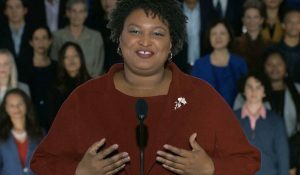 Stacey Abrams concluded: “Our progress has always found refuge in the basic instinct of the American experiment – to do right by our people. And with a renewed commitment to social and economic justice, we will create a stronger America, together.” This was consistent with her emphasis on community and service. It’s hard to imagine that there could be a starker difference between the Republican and Democratic vision for the United States.